Looking to brighten up your life with some old school Hollywood-style glamour? 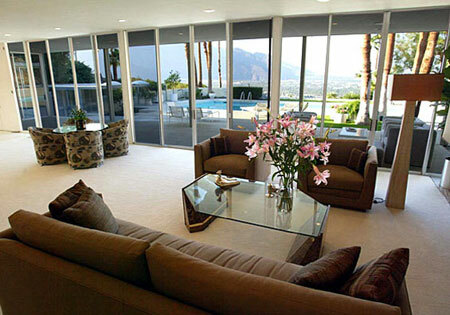 Well, book yourself into this William Cody-designed mid-century house in Palm Springs. California, USA. 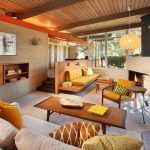 Built in 1964 for inventor/industrialist Stanley Goldberg, the house sits high in the San Jacinto Hills, part of a small gated community and sat next to a pair of mid-century gems by John Lautner. The interior was featured in Architectural Digest back in 1967 and many of its key features remain, rubbing shoulders with artwork and furniture in keeping with the design – including originals from the likes of Paul Evans, Ludwig Mies van der Rohe, Richard Schultz and Eileen Gray. In terms of specifics, the house has a large pool, great views, three bedrooms with en-suite bathrooms and built-in wardrobes, a powder room, media room, kitchen/diner, a living room with sunken bar, three patios and a couple of modern-day comforts – air-con and a large entertainment system. It’s available to rent now at a price of £4,500 ($7,000) per week. Not cheap, but if you have some money to spare, possibly the perfect getaway. 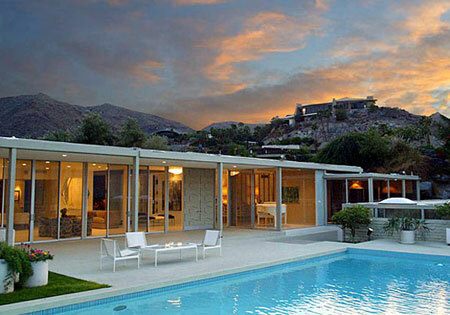 Is that the house used in the Mad Men episode, “The Jet Set,” which was set partially in Palm Springs? If it isn’t, it certainly looks like the same house!